CSO data on estimated unemployment (that used to be released with Live Register) shows estimated unemployment steady at 9.7% in July, for the third month in a row. 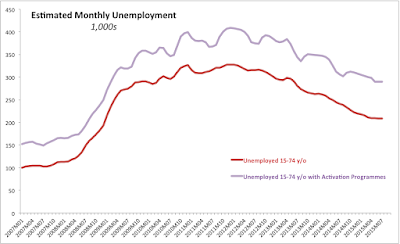 Officially, there were 208,900 unemployed 15-74 year olds in Ireland in July 2015, up 300 on June 2015. 3mo average through July is at 208,833 against 3mo average through April 2015 at 211,833, an improvement of 3,000 on 3mo average basis. Compared to July 2011, there were 107,500 fewer officially unemployed in Ireland. Compared to July 2014, number of unemployed in Ireland fell 32,400. However, factoring in those participating in State-established Activation Programmes, number of unemployed in Ireland stood at 289,788 (estimated using lagged data for Activation Programmes participation) in July, down 77,658 on July 2011 and down 16,128 on July 2014. 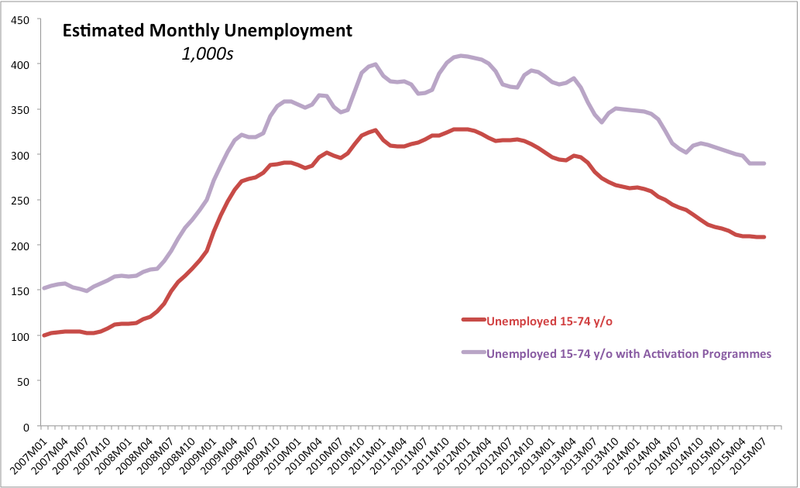 There were 37,600 younger unemployed in Ireland in July 2015 (15-24 year olds), up 700 on June 2015 and down 8,200 on July 2014. 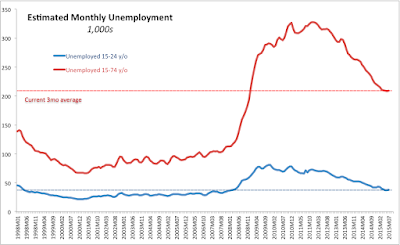 The number of younger unemployed declined 28,500 compared to July 2011. 3mo average number of younger unemployed through July 2015 was 37,233 against 40,300 average for the 3 months through April 2015. Estimated unemployment rate for 15-74 year olds stood at 9.7% in July, unchanged on May and June, down on 9.8% in March and April. 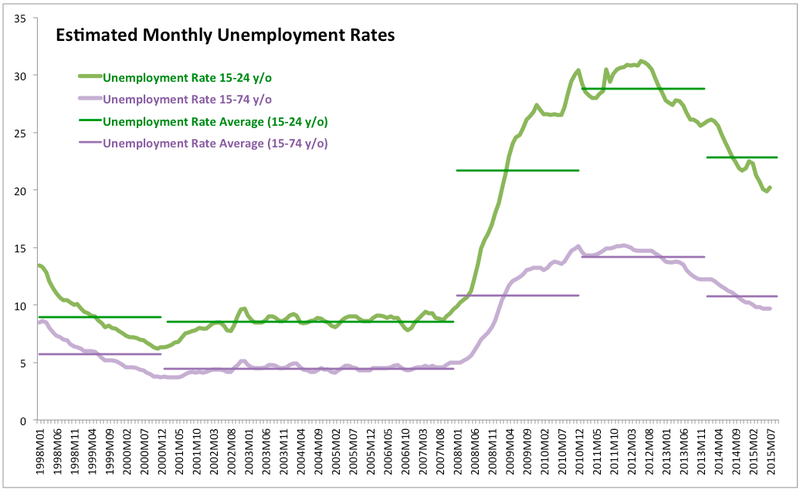 Unemployment rate is down 5 percentage points on July 2011 and 1.5 percentage points on July 2014. Last 4 months marked the slowest sequence of declines in unemployment rate since March 2014. Estimated unemployment rate for younger workers was 20.2% in July 2015 compared to 19.9% in June 2015. The unemployment rate declined 8.4 percentage points compared to July 2011 and was down 3.4 percentage points on July 2014. 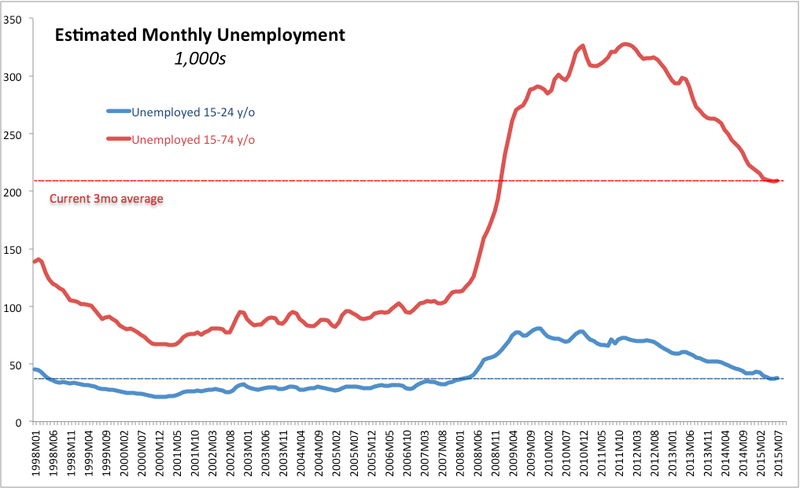 The key point is the slowdown in the unemployment rate reductions. Over 2012, average monthly rate of reduction in unemployment was 0.083%, this rose to 0.153% average over 2013 and 0.167% over 2014. 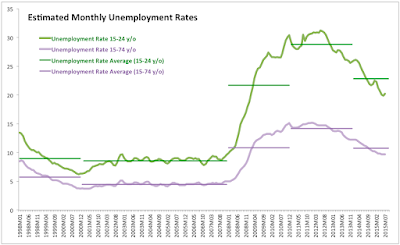 So far, over 7 months of 2015 the average monthly rate of unemployment rate decline was 0.071%.